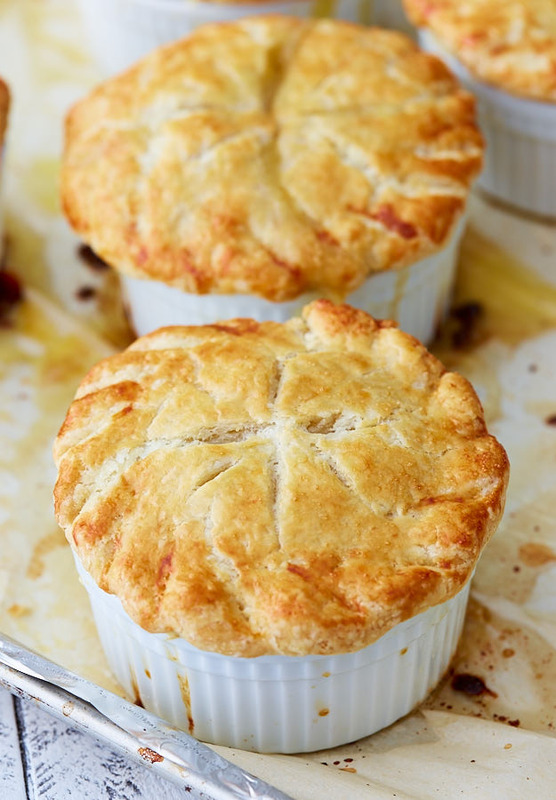 There is nothing like a rich, flavorful homemade chicken pot pie with golden brown flaky pie crust. Itâ€™s one of my favorite soul foods. Actually, everyone in our family is a fan of a good olâ€™ homemade chicken pot pie made with love. In a separate bowl, dissolve the cornstarch in the milk. Set aside. In a large saucepan, add two tablespoons of butter and saute the onion, carrot, and celery over medium-high heat for about 3 minutes. Add the broth and the potatoes, and bring to a boil. Cover and simmer for about 10 minutes or until the vegetables are just tender. Add the butter and flour mix and bring to a gentle boil, constantly stirring. Pour in the milk and cornstarch mixture and bring to a boil. Add salt and pepper to taste. Stir in the chicken and peas. Cover and let cool. To prepare the pie dough, in a food processor, combine the flour and salt. Add the butter and pulse a few times until the butter is the size of peas. Add the water and vinegar and pulse a few more times. It does not need to come to a ball. It will look like a big pile of crumbs, and that's what you want. Remove the dough from the food processor and place on a large piece of Saran wrap. Twist the plastic to tighten the dough into a ball. Cut into two pieces, and flatten each piece into a disk. Cover with a plastic wrap and refrigerate for 1 hour. Alternatively, twist the plastic wrap on both ends, as if you were wrapping a candy. Cut the dough into 8 disks. This will make 4 portioned chicken pot pies that can be baked in ramekens. On a lightly floured work surface, roll out the two dough discs into two circles, one about 13 inches in diameter and the other about 10 inches in diameter. With a sharp knife, make a few slits in the second (10 inch) dough circle. Line a 9-inch pie dish with the larger dough circle. The dough should overhang the dish by about 1/2 inches. If making 4 single portion pot pies, roll out 4 disks into 8"-9" circles and 4 disks into 5"-6" circles respectively. Spoon the chicken filling into the baking dish. Cover with the second sheet of dough. Crimp the edges and tuck them in. Brush the top with egg yolk wash. If making single portion pot pies in ramekens, repeat the process four times.